We like to think of our team as part of the Perillo Family. What better way to motivate and excite your employees to excel at their jobs and to generate greater employee retention, satisfaction, and stronger team work than to bring them together during the travel experience. 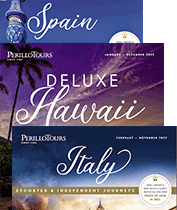 Since 1945, the Perillo family has been America’s leader in incentive travel to Italy and beyond. There is no greater team building experience than visiting sites where history, culture, art and business connect people through a hands-on experience. Your team will experience local customs and foods, while connecting with co-workers and nurturing relationships. The experience must be innovative, engaging, and most of all, fun for the employees, while providing long term ROI and best practices for the organization.